1990 - 1997 - Brighton technical school, Victoria, Australia. SEASPRAY 1990 BRIGHTON BAY SECONDARY COLLEGE. Page 1. This year on the front cover we have placed the school motto together with drawings of our coat of arms, the unmistakable front porch of the administration building and the new name of the school. Older generations used short pithy sayings such as ‘a stitch in time saves nine, look after your pennies and the pounds will look after themselves’ to guide their lives. Similarly, a motto represented a principle with which an organization prided itself and its members were encouraged to do their utmost to live by it. Unfortunately, mottoes are usually expressed in a language which few understand. This, I suppose, adds to their mystique, but it also turns them into meaningless expressions with mere decorative value visible on doorways, memorial boards and letterheads. The motto of Brighton Bay Secondary College is very relevant to everyone, particularly to students. Nosce tempus is Latin and it literally means know the value of time, or, make good use of your time, or, as teachers love to tell students, do not waste time. This magazine has been put together with the help of several students and teachers. In particular the Journalism class and their teacher Mrs. Katina Pantzopoulos have to be thanked for the typing, interviews and for writing some articles. Thanks also to go to Desi Potiriadis for the art work. I must not forget the unrewarded co-operation and disappointment of those who posed for photographs which did not come out and the students who submitted written material for which we could not find space in the magazine. Our aim was to make this publication something of a souvenir for students and staff with wide school representation, but, given the limited resources available, we have succeeded in covering some areas only. I think, nevertheless, that the end result is pleasant. SEASPRAY 1990 BRIGHTON BAY SECONDARY COLLEGE. Page 2. This has been the inaugural year of Brighton Bay Secondary College, and this is our first College Magazine. Another milestone in the long life of this school. Our enrolment has continued to increase, which is very rewarding for Staff who work so hard in this school. This year the V.C.E. Year 11 was introduced in English, Mathematics and Australian Studies, and next year it will be introduced across all subject areas. I am positive that students and teachers will find this a challenging and exciting learning process. We have had a number of staff changes this year – David Dunwoodie and Glenn Rodda transferred to other schools. Anne and Alex McLeod resigned and moved to Clifton Springs, Linda Fisher and Christine Ceddia gave birth to beautiful bouncing babies and are on Family Leave, and Kevin Foster and Brian French retired (some people have all the luck!) I sincerely wish them well in the future. New permanent staff to join us this year are – Liz. Tye in Humanities, Chris Manteris and Desi Potiriadis in Art, Gay Hughes and Gayle Slater in Photography, Vlodik Zmyslony in Maths/Science, Sophie Murphy in Textiles and Riva Long in media, and I must mention our Emergency Teachers – where would we be without them? Rosemary Hayes, Esther Erlich, Carolynne Lewens, Ray Francis, Peter Scott, Mick Young, Jane Saleeba, Paul Belleville, Marg. Speechley, Kevin Cotter, Katina Pantazopoulos and Sue Lewis. Kevin Foster, our Acting Vice Principal now retired, has been replaced by Greg Holman, who is putting his own stamp on the job. “The King is dead, long live the King”. It’s a fact of life that I will be facing soon – upon retirement, there is always someone there waiting in the wings for their chance. There were also new Council members this year – Sarah McQuarrie continued as a very competent School President and Fred Fryda became the Vice President. New faces were students Elizabeth Heeps, Wayne Baker and Kylie Freyer, new staff Sue Pullen, Monica Black and Tony Dowse, and new parents Judith Heeps, Shirley Bilson and Lynne Akkus. This year has been a particularly busy year for School Council as we have selected a new Vice Principal (Greg Holman), and taken part in a Review of our curriculum. Thanks go to all our Council members for the amount of commitment they have given to our school – the new members above, and the continuing members, Greg Holman, Myer Bloom, Joan Cameron and Michael Phillipson. This year has been particularly important in that we have introduced a full Art Exhibition (similar to our very successful Photography Exhibition), and we are re-modelling our Technology Centre. This latter project is very exciting as all trade areas will be under the one roof, together with a computer designing area. I predict that next year will be a very successful year in Technology. At the end of this year our Disadvantaged Schools Program funding will terminate – and our two most helpful and dedicated workers in this program, Mary Borghero and Dianne Padgham, will be transferred to another school. Mary has been here for five years and Dianne just over two. They are two most cheerful and willing personnel on the staff who have worked hard to encourage parent, student and community participation in this school as well as taking an active part in promoting the school. They will be missed by us all. To all of our students leaving school this year I wish them every success for the future, and sincerely trust that Brighton Bay Secondary College has contributed to their fulfilment. To those returning, I look forward to another rewarding year in 1991. TO ALL STAFF – the untiring office, cleaning, grounds and maintenance staff and Teacher Aides who keep the wheels oiled, and the teachers who devote so much time and effort to their students, I sincerely thank you all. I believe that we have developed a real team effort this year – I’m proud of you. SEASPRAY 1990 BRIGHTON BAY SECONDARY COLLEGE. Page 4. In opening this report I would like to pay tribute to Kevin Foster who retired in July. Kevin had been Vice Principal for 15 months during which time he was very supportive of staff and students gaining the respect and confidence of both groups. I have enjoyed being Vice Principal during the second half of the year. I have found it a time-consuming role always with something to do whether it be an administrative task or a discipline matter. The aspect I have enjoyed most is dealing with the unexpected. Each day there will be situations arising that you cannot plan for but which must be dealt with. As Vice Principal I have had dealings with students of all year levels. The majority are committed to their studies, display a willingness to learn and use the facilities at the school to their advantage. During the year we have seen students leave and enrol. The majority of those leaving gaining employment while those entering the school during the year doing so because of our range of subjects, facilities and their friends. I am appreciative of the support I have received from teachers, office staff and ancillary staff. They have all worked hard at providing a learning environment for all students. I would like to thank all the emergency teachers who have worked during the year. They have made it possible for us to continue to offer our comprehensive curriculum while staff are on leave and after staff retirements. Next year promises to be challenging with the introduction of the new V.C.E. fully into year 11 and with English, Maths, and Australian Studies at year 12. Teachers have been developing V.C.E. curriculum during the year which should ensure a smooth transition. In closing I would like to thank Doris for all her support and help, wish all the students completing year 12 success in the future and wish all other students, staff and parents a Merry Xmas and look forward to seeing you in the New Year. SEASPRAY 1990 BRIGHTON BAY SECONDARY COLLEGE. Page 5. Many people, I included, would endorse Bill Hayden’s philosophy of striving to help people reach their full potential in life, despite the difficulties. In order to reach my full potential I find it very important to be loved and accepted unconditionally. This appears to be a universal need. I have experienced this love and acceptance from God and other people. It is very liberating and gives me hope and direction for living and working as a chaplain. It has been wonderful to experience the warm welcome by both staff and students in this my first year as chaplain to Brighton Bay. It has been a very busy year in terms of involvement with the S.R.C., the breakfast programme, activities, meetings, Austudy, D.S.P., welfare, as well as excursions, campus and seminars on goal setting and relationships. It has also been good just to have chats over a cuppa in the yard or while kicking the footy. Thank you for sharing yourself with me in many ways, including your joys and difficulties. It is a great privilege to be working with you and for you. Footnote – Quoted from a speech given by the Governor General on 7/7/90; printed in the L.T.J., Vol 24, No 3, P.111. ​SEASPRAY 1990 BRIGHTON BAY SECONDARY COLLEGE. Page 16.
arms are swinging, talking loudly. it is only herself she is talking to. Her oversized dresses fit her tightly. Her gleaming black hair sits snugly around her neck. In her hair nestle many clips and combs in disarray. each one for every hard year she has survived. and old scuffed school shoes. and her family won’t be able to make it. Of course they arrive as they do every week. laughing one moment, crying the next. yet it has not stolen her ability to love and care. SEASPRAY 1990 BRIGHTON BAY SECONDARY COLLEGE. Page 18. During 1990 the S.R.C. has continued to be an active agent in voicing the opinion and ideas of the students. It has met fortnightly. The following gives a few highlights and issues that have occurred. At the start of the year and halfway through the year some S.R.C. members attended a training seminar at the Bayside School Support Centre. Throughout the year many year levels asked for help to organize camps but there were a variety of factors that made this difficult. The graffiti wall was pursed by the S.R.C. but then, due to the lack of interest by students it was not finalized so that it could be passed through School Council. It was pursued no further. Halfway through the year the Macintosh computer was relocated from the computer room to the library, but unfortunately it was stolen. Another issue was spitting in the school grounds. “Some students thought that the rule was harsh, and after discussion this was referred to the committee reviewing the school discipline policy. The Chaplain (Michael Pietsch), brought some “Red-Nose Day” items which were sold by several S.R.C. members. From the start of the year the cleaners complained about the rubbish being dropped by students, so a roster was organized involving the students picking up rubbish after lunch time. The S.R.C. also tried to organize ‘can’ recycling. Due to the new “State of the Art” technology centre not being quite completed, it has not been possible to constructed a metal frame to hold up the bag. But this will soon be done. During the District Provision discussions the S.R.C. strongly supported Brighton Bay Secondary College remaining a years 7 – 12 independent campus. The M&M drive was one of the S.R.C.’s biggest fund raisers this year involving the whole school. Doris, we would like to thank you for the lunches and the use of your office each month. Thank you very much. We would also like to say thank you to the following people who attended the meetings : Michael Pietsch, Steven Mantell (Chairman), Eroni Komitai (Vice Chairman), Wayne Baker (Secretary), Samuel Abdel-Malek, Mrs. Monica Black, Eamonn Burford, Gareth Burford, Marc Krawczyk, and other students who attended occasionally. Wayne Baker and Eamonn Burford. SEASPRAY 1990 BRIGHTON BAY SECONDARY COLLEGE. Page 19. REPORT FROM PRESIDENT OF SCHOOL COUNCIL. ​School Council is always an enjoyable and worthwhile experience for me, and I hope for all the others concerned in it. School Council is made up of parents (Lyn Akkus, Michael Phillipson, Shirley Bilson – and Judith Heeps, the latter resigning because of an interstate move); students (Wayne Baker, Elizabeth Heeps, Kylie Freyer and Leigh Slade – now down to only Wayne as the others have left); community members (Joan Cameron and Fred Fryda); teachers (Myer Bloom, Tony Dowse, Greg Holman and Sue Pullen); staff (Monica Black); and the Principal (Doris Poole). All these people have served the school very well, often acting on more than one other committee and attending conferences and seminars at nights and weekends. It is impossible to single out any individual, but I would like to thank the students particularly. If anyone thinks our students are only token members, they should attend our meetings as observers. The Chaplain, Michael Pietsch, is often in attendance even though he is not a voting member of the Council and adds to the depth of discussions. Our excellent minutes are taken by the Registrar, Caraleen Potter and equally excellent secretarial back-up is provided by Joan Miljoen. One very important function of the current Council was the setting-up of the Vice-Principal Selection Committee and I would like to thank Shirley Bilson, Michael Phillipson (parent reps), Michael Mantel (Union rep), Penny Gibson (Teacher rep), Judy Williams (Ministry rep), and Doris Poole for the hard work and commitment they showed during this process. From a field of high quality candidates we picked Greg Holman and our choice has now been confirmed by the Ministry. Greg, or ‘Flame’ as he is sometimes affectionately called by students, teachers and parents alike, will continue to be a great asset to the school. The other committees of School Council are : Finance, Buildings and Grounds, Chaplaincy, Publicity, Disadvantaged School Program, Equal Opportunity, Curriculum and Integration. Others who are not School Councillors also participate on these committees and we appreciate their efforts. Needless to say we always need new members as schools, by their very nature, have a changing population. Early next year elections for School Council will take place and I would ask you to think about nominating as schools would find it impossible to function in the modern educational climate without an active and representative School Council. I hope you and your families have a happy and enjoyable Christmas holiday and a prosperous 1991. SEASPRAY 1990 BRIGHTON BAY SECONDARY COLLEGE. Page 38. THE LIBRARY AND THE V.C.E. With the introduction of the V.C.E. and student-based learning, next year all libraries – school, local and tertiary – will assume an even greater role in the education process. This year the B.B.S.C. library has been gearing up for the tremendous changes ahead. Throughout the year I have attended regular V.C.E. network meetings (and last month we hosted such a meeting. These have been invaluable for the sharing of ideas, information and concerns/whinges – and as a means of making friends with Teacher/Librarians from neighbouring schools. Already students are gaining from this sharing resources, with inter-library loans of videos and periodical articles required for Year 11 assignments.) As well, library staff have been evaluating and expanding our collection to cope with new V.C.E. subject areas. It is already evident that next year will see a much greater reliance on ‘ephemeral’ material. No longer can students rely solely on books, but will need to make regular use of current newspaper articles from the vertical file, up-to-date periodicals and television documentaries on all manner of subjects. Thankfully in Term 4 we welcomed a new member of staff, D’Metri Kakmi, who was appointed two days a week to revitalize an Audio-visual department that had become more and more moribund the longer we were without a qualified A-V person. In the short time he has been here, D’Metri has already transformed both the quality and the quantity of our video collection. In addition he has been ‘working overtime’ instructing Year 11 students how to use the video cameras. One can only conclude that there are some wonderfully creative Communication Projects being submitted. Next year will be different, a challenge for not only Year 11 and 12 students but for staff as well. V.C.E. will mean a Very Concerted Effort from all of us (Students please take note!) But in the meantime, we are looking forward to the coming holidays, and a chance to recharge the batteries and the brain-cells. Selecting people for special thanks is a risky business, but here goes ….. To Chris for supplying me with her students’ work whenever I needed to make cosmetic changes to the library; To Desi for her displays and fine calligraphy; To Julie Smith who this year has worked every Thursday on a voluntary basis, previewing videos and helping to set up the new A – V borrowing system; To D’Metri who has so quickly become part of the team; and to Evelyn for her tireless work and enthusiasm during the year. Plans for 1991? To seek a major grant from Tattslotto, the Tooth Fairy or the State Coffers, (the first two are more likely possibilities!) for the installation of a desperately needed security system. Any fund-raising suggestions welcome. SANDRINGHAM-BRIGHTON ADVERTISER, Tuesday, May 28, 1991. Page 3. UNITED STAND TO SAVE COLLEGE. Students and parents of Brighton Bay Secondary College will join forces with the School Council to fight plans by the Education Ministry to close the school. A public meeting has been called for May 30 to launch a campaign to prevent the proposed shut-down and possible closure of the school in Cochrane St., Brighton. The Ministry of Education and Training announced on April 30 that Brighton Bay Secondary College should close and students should be transferred to other schools in the district – Ardoch-Windsor, Prahran, Elwood and Hobsons Bay secondary colleges or Malvern Central School. A press release from the general manager of the Southern Metropolitan Region (office of schools administration), Dr. Jean Russell said a District Curriculum Review found an “imbalance of enrolments between colleges and between year levels, particularly Brighton Bay. Brighton Bay Secondary College, formerly Brighton Technical School, was first established in 1922. It sits on 4 ha of land in Cochrane St. and has 455 students, most studying Year 11 and 12 subjects. Acting principal of Brighton Bay Secondary College, Mr. Greg Holman, said the school council had written to Education and Training Minister Mr. Barry Pullen opposing the closure. Mr. Holman said students and parents were “very upset”. He said all students and parents had been invited to the public meeting in the school’s hall on Thursday (May 30) at 7 pm to discuss plans to oppose the closure. Mr. Holman, speaking on behalf of the school council, said the college attracted many students from outside the district because of its popular art, photography and outdoor education courses. “These facilities can’t be duplicated,” he said. “The Brighton Bay Secondary Council is wary of any review that proposes the closure of any school. We feel there are more economic reasons than any others for the current proposal,” the statement said. The secretary of the Brighton Historical Society, Mrs. Rosalind Landells, said she would be disappointed to see the college close. A STAND - WITH EYES ON LAND. Brighton Council will consider acquiring some of the land at Brighton Bay Secondary College if the school closes next year. The council, however, expressed its desire that the college remain open. At the May 20 meeting, Cr. Rayleen Haig said it was important that the council expressed this desire. The college had been part of the community for almost 70 years, she said. Cr. Haig said a feasibility study on the college land, which would probably be used as parkland, would only happen “If the unfortunate occurs” and the school closed. Cr. Ivan Saunders said council’s first priority was to support the school. But Cr. Peter Patrick said the council should remain “rigorously neutral on this issue”. SANDRINGHAM-BRIGHTON ADVERTISER, Tuesday, June 11, 1991. Page 10. FIGHT IS ON FOR SCHOOL. Students, parents and teachers at Brighton Bay Secondary College have formed a “fighting” committee to prevent the closure of their school. About 400 people at a public meeting on May 30 elected a committee to form strategies to prevent the recommended closure of the school by the Ministry of Education and Training. The committee of 25 is headed by the acting principal of the school, Mr. Greg Holman. Mr. Holman said the school council was “very encouraged by the support from the local community” at the meeting. He said people at the meeting had been asked to sign a petition opposing the school’s closure, and so far more than 400 signatures had been collected. The petition is to be presented to the Speaker of the Legislative Assembly. Mr. Holman said people had been encouraged to write to members of Parliament and to the press, lobbying for the school to remain. The college formerly called Brighton Technical School, is in Cochrane St, Brighton, and was established in 1922. On april 30 the Ministry of Education and Training recommended that the college should close and students be relocated to other schools in the district. Mr. Holman said the committee would meet on June 11 to discuss action and any further developments. SANDRINGHAM-BRIGHTON ADVERTISER, Tuesday, June 25, 1991. Page 1. COLLEGE CLOSURE PLAN A CYNICAL EXERCISE : CLAIM. The school council of Brighton Bay Secondary college claims the Education Department wants to close the college because it is more valuable as vacant land. The school council believes the proposed closure is a “Government fundraising” exercise which puts the needs of students second. School council president Mr. Michael Phillips issued a statement last week which said : “This whole exercise is a cynical manipulation of students’ futures in pursuit of an easy revenue source for the cash-strapped Kirner Government. The Brighton Bay Secondary College Fighting Committee was formed last month to fight the department’s recommendation that the school be closed and students relocated to other schools in the district. Principal Mr. Greg Holman said the school stated its case for staying open at a district review committee meeting at Prahran School Support Centre on June 19. At the meeting, members of the Education Department heard submissions from six schools in the district – Brighton Bay, Ardoch-Windsor, Prahran, Elwood and Hobsons Bay secondary colleges and Malvern Central School. Mr. Holman said the department’s review committee “heard the position of each school” and would then draw a conclusion. About 40 protesters (students, teachers and parents), waved banners outside the Prahran School support Centre before the review committee met last Wednesday. Mr. Holman said the protest showed the department it could not close the school without a fight. He described it as a very orderly and enthusiastic protest. A department spokesman said no decision would be made until the “consultation process” was complete. He said this would take about three months. Mr. Phillips said the proposed closure was Mrs. Kirner’s second attempt to “grab the valuable college land”. “As Education Minister she failed in the first attempt to use student numbers as an excuse to close the college. When that proved politically unacceptable the Education Department redefined the criteria, claiming the college couldn’t provide the necessary spread of curriculum options,” he said. SANDRINGHAM-BRIGHTON ADVERTISER, Tuesday, July 16, 1991. Page 11. BATTLE TO KEEP COLLEGE OPEN. ALL IS NOT LOST, SAYS PRINCIPAL. The fate of Brighton Bay Secondary College appears to be doomed, with the Ministry of Education and Training moving to officially register the transfer of courses from the college. But the college fighting committee has asked for a deputation to the Premier, Mrs. Joan Kirner, the Education and Training Minister, Mr. Barry Pullen, and the Manufacturing and Industry Development Minister, Mr. David White, to state its case to remain open. The college principal, Mr. Greg Holman, said the morale of the fighting committee was “very high”. “We feel we can win the fight as there is still room to manoeuvre, All is not lost,” Mr. Holman said. In March, the Education Ministry announced that the college should close because of low student numbers. Students were to transfer to other schools in the district. In the statement, the general manager of Southern Metropolitan Region, Dr. Jean Russell, said : “Brighton Bay Secondary College’s insistence that the college remain a (Year) 7 to 12 college cannot be supported on curriculum grounds. Mr. Holman said girls were not disadvantaged at the school. He said there were a range of course choices for girls, female students took part in a “peer support system” and the overall number of boys and girls in the school was even. Mr. Holman said the school had low numbers in the early years because many Brighton families sent their children to private schools, but opted for a technical school education in later years if the student was not suited to an “academic” education. “If we close, there will be no alternative for them,” he said. Dr. Russell said the closure of Brighton Bay would see its programs, teachers and resources transferred to other local colleges. “This means that students at these colleges – who are from the local area – would benefit from the resources now at Brighton Bay,” she said. Forward the report within 60 days. SANDRINGHAM-BRIGHTON ADVERTISER, Tuesday, August 6, 1991. Page 14. The school council of Brighton Bay Secondary College has refuted the Ministry of Education’s reasons for wanting to close the school. The school council describes a statement by the ministry’s general manager of Southern Region, Dr. Jean Russell, (Advertiser, July 16), as containing “inaccuracies” and “distortions”. In the statement, Dr. Russell said the college “cannot provide a comprehensive curriculum at Years 7 to 10 because it does not have sufficient students”. In response, the school council president Mr. Michael Phillipson said the school did provide a comprehensive curriculum “in accordance with the Government’s curriculum blueprint Frameworks”. “This has been communicated to Dr. Jean Russell and has been supported with documented proof,” Mr. Phillipson said. “Dr. Russell states that business and humanities programs are not offered at VCE. In June, teachers, students and parents at the college set up a fighting committee to stop the proposed closure. Principal Mr. Greg Holman said a request by the committee to send a deputation to the Premier, Mrs. Kirner, had been refused. He said the college received a letter from Mrs. Kirner saying she was “too busy” and had asked a member of the Education Ministry to respond to the college’s claims that it should stay open. Dr. Russell stated on July 4 that the low proportion of girls at the college meant that they were disadvantaged. Mr. Phillipson said recent newspaper reports had indicated that Victoria was facing an “education crisis” because inaccurate statistical estimates understated school enrolment projections by about 100,000. “Closing schools is not the answer. It is an economic answer which attempts to satisfy the enormous government deficit,” Mr. Phillipson said. SANDRINGHAM-BRIGHTON ADVERTISER, Tuesday, December 17, 1991. Page 3. ACTION PLANNED TO KEEP COLLEGE OPEN. PARENTS and students plan to occupy the Brighton Bay Secondary College buildings over the school holidays in a bid to prevent the college’s permanent closure. The Education Ministry proposes to close the college at the end of the year, but students and parents are still fighting for its survival. The school community will rally support for the college to stay open at a public meeting tonight (Tuesday) at the school at 7.30. On December 2, Education and Training Minister Barry Pullen announced that the college would close this year. Programs in photography and art and design would be transferred to other schools in the district along with students and teachers. Speaking on behalf of the school council, principal Greg Holman said the school community was “concerned and dismayed” by Mr. Pullen’s announcement. “The school community is very angry at the decision made by the minister, especially in light of the fact that he would not allow us to meet with him to discuss our report that recommended we remain open,” he said. Mr. Holman said details of the holiday occupancy still had to be worked out, but the basic idea was for parents and students to live there so the buildings could not be snatched from them. Mr. Pullen said there was an “overwhelming case for the closure”. “While the college has some quality programs at Year 12 level in photography and art and design it cannot meet the minimum VCE curriculum requirements in a number of key areas,” he said. “The lack of enrolments in Year 7 to 10 also shows that the school does not have the support of local primary school parents.” Mr. Holman said the school’s enrolments were affected this year because of the publicity surrounding the possible closure of the college. “Parents inquiring through the regional office (of the Education Department) about courses available at Brighton Bay have been told we were closing, even before a decision was made,” he said. The general manager for schools in the Southern Metropolitan Region, Dr. Jean Russell, last week said immediate steps would be taken to establish an “implementation committee” in a conference format to plan for the school’s closure. She said the implementation committee would be required to prepare recommendations on communication strategy for parents, teachers and students, appropriate arrangement for placement of students, and arrangements for distribution of college funds, equipment and resources. Mr. Holman said the school council, parents, students and teachers had already voted against taking part in the implementation committee. Mr. Pullen said he was disappointed the college had not fully taken part in the school’s reorganisation process which began in 1986. “It is clear that a decision to keep the college open would simply be delaying the inevitable,” he said. Mr. Pullen said 56 students were attending Year 7 to 10 classes at Brighton Bay in October and these number were expected to drop to 27 in 1992. Mr. Holman said enrolments had been increasing over the last three years – “the only college in the district to do so”. “I am confident if we did not have the threat of closure hanging over our head, and that our enrolments had not been sabotaged, then our student numbers would have continued to increase,” he said. SEA SPRAY BRIGHTON BAY SECONDARY COLLEGE 1991. Page 2. Brighton Bay Secondary College (formerly Brighton Technical School), is a State Government school that has been serving the wider community since 1922. We have a proud record of successful students who have proceeded to Tertiary Studies, apprenticeships and employment, including many who have attained distinguished careers in Business, the Arts, Literature and Sport. Our senior students achieve exceptionally high rates of entry into tertiary colleges including R.M.I.T., Phillip, Swinburne, Bendigo and Prahran Institutes, Monash University (Chisholm), Victoria College (Rusden) and T.A.F.E. Colleges. Our wide variety of technical and creative courses and our comprehensive curriculum attract students from all over Victoria. The College is set in spacious and attractive grounds. It has excellent facilities, including a well stocked and inviting library, modern audio-visual equipment; extensive audio visual resources; a College bus; a College car, (traffic safety education); a College hall with gymnastic, basketball, badminton and volleyball facilities; excellent Photography, Art and Outdoor Education equipment and rooms. There are computers in use across the curriculum and a recently developed Technology Centre designed to meet current curriculum requirements. We are centrally located and easily accessible, being well served by train and two bus lines. The College’s comprehensive curriculum encompasses a wide variety of learning experiences covering academic, technical, creative and vocational fields. The needs of modern society necessitate the consideration of knowledge in a wider perspective so that skills and adaptability become an important component of the school curriculum. We have an Equal Opportunity and Social Justice Officer who coordinates the implementation of our Equal Opportunity Policy ensuring students have access to “fair, just and challenging” educational experiences and that all students “experience success”. Consequently our curriculum is “inclusive”, catering for all students, encompassing differences in gender, social and cultural background, physical and intellectual ability, learning pace and style. The college recognises the right of every student, irrespective of their background, to an education, and it operates according to the Social Justice Framework. We have a full time chaplain, an organised Welfare and Integration Program and a school team (parents, teachers and integration aid) who have successfully completed the I.S.I. (Inclusive Schooling Integration) Program. We have a detailed curriculum Policy Document. WELFARE AND DISCIPLINE POLICY SUMMARY. Our detailed Discipline Policy is closely related to the educational philosophy of the school. The discipline Policy requires students to recognise that people have a right to learn and teach without interference. Consequently they are expected to obey College rules, respect their peers and teachers, and to care for the facilities and equipment they use. Students are expected to attend regularly, and complete all set work. We believe the school has the responsibility to develop in students self esteem, self discipline and a willingness to accept responsibility for their own actions. Although positive support for students is constantly provided, persistent violation of the rights of others will result in disciplinary consequences as outlined in the Policy. ​SEA SPRAY BRIGHTON BAY SECONDARY COLLEGE 1991. Page 6. 1991 saw a change in the administration. Doris Poole our Principal since 1988 retired in February. I took up her position in an Acting capacity while Penny Gibson began as Acting Vice Principal. Our enrolment has continued to increase, a trend of the past three years. This is an indication of the successful programs we run at years 7 – 12 with the T.12 and T.O.P. courses attracting students from across the State. Teachers are to be congratulated for the work they do to ensure all these programs are successful. The VCE was introduced fully at year 11 with English and Maths at year 12 level being run under the VCE. Next year will see the introduction of the full VCE across years 11 and 12. Teachers have been working diligently to ensure our successful T12 and T.O.P. courses articulate into the new VCE. We gained new permanent staff members during the year – Jeff Miller – Technology, Matthew Pick – Library, Noel Williamson – Business Studies, Rosa Guastalegname – Art, Leslie Truffle – Humanities. All these staff members have settled into the school and are contributing well. We employed the following Technicians during the year – Francis Reiss and Tracey Mendum in Photography, D’Metri Kakmi in the library and Louise Mall in the Art Department. I thank all these for their assistance during the year. Two of our Ancillary staff have resigned during the year – Lynn Akkus and Grace Tolson their positions have been taken by Patricia Walker. There have been a number of changes to our school Council membership this year. Sarah McQuarrie retired as School Council President after serving the school extremely well for the past 4 years. Michael Phillipson was elected President with Kath Still as Vice President. New faces on Council were Jill Mazzotta, Anita King, Peter Barker; teacher representatives, Kath Still, Darryl Norton and Pam Woodfield; parent representatives, Mary McKinnon, David Whelan, David Thompson and Steven Mantell; student representatives while Jill Beaumont and Allan Moore were new co-opted members. As can be seen we have had a large turn over of members on council who have bought with them new ideas and enthusiasm. I thank all new council members for their efforts during an extremely busy year along with those continuing members, Sue Pullen, Monica Black, Wayne Baker, Fred Fryda and Michael Phillipson. This year we have been faced with a proposal from the Ministry for the closure of our college. This has caused much concern amongst our school community who rejected such a proposal at a public meeting at the college. All sections of our school community have opposed the proposal and have been working tirelessly to ensure the Minister of Education and Training supports our recommendation to remain a stand alone 7 – 12 co-educational college. I am extremely confident that Brighton Bay Secondary College will be providing programs to years 7 – 12 in 1992. This year saw the completion of the new Technology building allowing all our Technology study areas to operate in one building. This is a very important concept when delivering the new Technology curriculum. Congratulations to Tony, Barry and Jeff for their work in developing and completing such a large project. Our photography area has continued to expand with more dark rooms and processing rooms being built to cater for the increasing number of students. All this development has been completed by Photography and Ancillary staff. I thank you all. I wish all our students completing their studies this year every success in whatever endeavours they follow and look forward to working with those returning in 1992. I would like to make special mention of our Ancillary staff; Monica, Tony, Dorothy, Glen, Clem, Fred and Pat for their contribution to the school. They are always willing to assist in any matter when asked while their assigned duties are always completed efficiently. I thank you for all your help during the year. Our school is fortunate that we have been able to call on a number of emergency teachers without whom we could not operate successfully. Jane Saleeba and Scott Forrest have been employed on an extended basis, while Chris Winn, Rosemary Hayes, Esther Erlich, Carolyn Lewens, Ray Francis, Peter Scott, Sue Lewis and Marge Speechly, (sorry if I missed anyone), have assisted when needed. The school has been running a successful integration program for a number of years and we are fortunate to have the services of two integration aides; Judy Walters and Cheryl Meagher, whose support for the students and teachers is very much appreciated. I thank the office staff, Caraleen, Joan, Rhonda and Lina for their untiring efforts during the year and their happy faces that always helps cheer us up. Finally, I would like to congratulate our teaching staff on their performances during the year and thank them for the time and effort they contributed so willingly during a difficult year. To all parents, students and staff I wish you a Merry Christmas and a Happy New Year. SEA SPRAY BRIGHTON BAY SECONDARY COLLEGE 1991. Page 8. When I began teaching at Brighton Bay Secondary College (or Brighton Tech as it then was), the Vice Principal was Mr. Hunt. Even the staff called him Mr. Hunt. He had a constant succession of naughty boys and girls outside his office, (many of them sent to get the cane), and held regular uniform parades. Any students who wore even the wrong coloured socks would be sent home to change – a great way for students to waste an hour or two. Over the years, Vice Principals have become more approachable – even human – while still managing to uphold the discipline required. The duties have changed greatly. Some things remain constant – filling in the necessary paper work, disciplining students, no longer, fortunately, with the cane; but a Vice Principal’s duties now also includes administering First-Aid, from cuts and bruises to potentially life threatening situations, counselling of students, staff or parents; attending meetings (endlessly); following up truants or students who miss detentions; answering the phone (endlessly); and generally ensuring the smooth day to day operation of the school. And in that regard, I’d like to thank all those staff members, and especially Greg Holman, who have helped me, supported me in my Acting role. SEA SPRAY BRIGHTON BAY SECONDARY COLLEGE 1991. Page 9. “What an exhausting trip,” I thought as I disembarked from the bus, on which eighteen students and two teachers had travelled to Lorne for the Arts and Photography camp. As soon as we arrived at the Spring Lea guest house, everyone including myself was eager to get inside and unpack. Of course we had to endure a lecture from our supervising teachers on what was and what was not allowed, first. Finally, after the rush for the furthest room from the teachers and everyone had unpacked, we began our first group activity. This was a simple relaxing walk down to the pier. This was really lovely. We all enjoyed the picturesque view of the sun setting. Many Photography students took photographs. After our walk we all helped to prepare for our barbeque tea. We dined either outside or in front of the television. The next day was a wet one. The rain seemed to be never ending, so most of the morning was spent indoors. However we made the most of our afternoon by going on a long hike, which nobody really enjoyed as it proved just how unfit we all were. The camp evenings were really enjoyable. Most of us would sit in the back garden and talk under the stars. The third day of our camp was a lot sunnier than the second had been, and there was quite a bit on our agenda. We headed down to the beach at about mid morning and there we broke up into three groups Each group designed and created a different sand sculpture. There were brilliant sculptures of sea horses, sharks, serpents and turtles. We went home for lunch and then set off again to see the waterfalls. I took lots of photographs of the falls as they were absolutely beautiful. The Art students also drew some wonderful pictures of the scenery. Unfortunately, at the falls one of the students fell on a slippery rock and split her chin. A trip to the local doctor’s quickly had her chin fixed up. That night was to be the last of 1991, Year 11, Arts and Photography camp. We were all outside, really enjoying ourselves when we got a “bomb scare”. We had many calls during the evening telling us that there was a bomb. After a while it became quite obvious that it was all a prank, so we all went to sleep. In the morning we were all still alive, because as we had thought no bomb had gone off. Our last day proved to be a most tiresome one of cleaning and travelling, it felt really good when the bus pulled in to the school. I knew I was home. SEA SPRAY BRIGHTON BAY SECONDARY COLLEGE 1991. Page 13. The new Technology Centre has enjoyed a very positive and successful first year. The students have responded positively to the challenge of new curriculum offerings and both staff and students have appreciated the well designed teaching learning environment. In addition, Geoff Miller who joined the Technology Team this year has been a valued member who has quickly earned the respect of colleagues and students alike. Among the established technology teachers Barry Whitehead has continued to enthuse all those around him and has been a source of inspiration to the students especially those doing the VCE – T12 Technology Studies Courses. On that latter point the Senior students, in particular, have been very successful in coming to terms with and benefitting from the well designed centre and the valuable technological resources at hand. Overall and encompassing all your levels the technology department has experienced a very successful year and the staff feel that the seeds have been sown for continued success in this area. Mr. Jeff Miller arrived from Moorabbin City Secondary College in late February to take charge of the Engineering side of the Technology Department. Since then he has enlarged the Department to include Sheet-metal, Plumbing, Plastics and more recently Automotives. Jeff teaches all class levels from Year 7 to V.C.E. T12. Students make the traditional models, hammers with plastic handles, car stands and tool boxes. However, Jeff is encouraging the senior students to develop their own projects. At the moment a trailer is being built, a bench press for weight-lifting and storage shelves. The Engineering shop has excellent equipment for the students to develop their own projects. There are lathes, mills, surface grinders and welding facilities, including M.I.G. SEA SPRAY BRIGHTON BAY SECONDARY COLLEGE 1991. Page 16. At Brighton Bay Secondary College Home Economics is one of the many subjects that are offered. It can be studied from Years Seven to V.C.E. ranging from basic cooking to the development of catering skills and related areas such as packaging, purchasing, nutrition and dressing. In Years Seven and Eight the topics that are studied are Good Hygiene, Basic Cooking Methods and Basic Nutrition. At this level the cooking involves mainly simple meals and snacks such as cakes and biscuits. In Years Nine and Ten cooking becomes more advanced and involves other related areas such as kitchen design, consumerism, wise buying, packaging and labelling. Cake Decoration is one of the major assignments and students are expected to cook and decorate a Christmas cake. In V.C.E. (Years Eleven and Twelve), students are involved in more advanced cooking, testing of a variety of cooking ingredients, methods to achieve the best results and aspects of commercial catering in preparation for further studies or employment in the hospitality industry. SEA SPRAY BRIGHTON BAY SECONDARY COLLEGE 1991. Page 19. THE LIBRARY, THE V.C.E. AND YES MINISTER. Anyone who hasn’t spent the past year on Mars, or buried deep in Antarctica, would know that 1991 has been a critical time for libraries in Victoria. Frequent media reports have documented the enormous strain put on both staff and resources since the introduction of the controversial VCE. So how have we coped with the crisis at Brighton Bay? Over many years we have built up a large and very specialized collection to support the courses for which Brighton Bay is famous. In addition, we are fortunate to have a spacious library which can comfortably accommodate the influx of VCE students who gravitate here during their free period. To date, the staff has survived the year without visible signs of a collective nervous breakdown. In fact the library has not only survived, but thrived during 1991, and we look forward to next year, confident that we can continue to fully support the programs offered to our years 7 – 12 students. We believe that Brighton Bay has one of the best school libraries in the state, with resources painstakingly acquired over years, a tolerant and dedicated staff and an atmosphere that is conducive to enjoyable learning. Given this confidence in our ability to support the school community, as well as our beautiful working environment, why is the library feeling so damned angry? The reason, of course, is obvious – it’s the same reason that the rest of the teaching staff is outraged. Here we have a superlative library, at a time when the importance of a school library can not be overestimated, and some faceless bureaucrats, who have never even taken the trouble to come out and look at our facilities, decree that we are to be forcibly closed down – a closure that is against the wishes of not only the school community of students, parents and staff, but against the wishes of the neighbourhood community. What we offer, we are told, can be transferred, relocated, “articulated” (to use the latest ED speak) in other sights. It seems that, to the ministry, we are expendable as a load of old bricks and mortar. If it weren’t so tragic, such a waste of valuable public assets, paid for by taxpayers’ money, this ‘Sir Humphrey’ solution to the economic crisis would make a comic television script. Meanwhile, life has to go on as normally as possible – and it does, even under these trying conditions. In February we welcomed a new staff member to the library. Matthew Pick comes to us from McRob, and quickly settled in to become part of the gang of four (sorry Art Department, we’ve usurped your title). Apart from being the resident expert on cricket, classic and Capetown politics, Matthew keeps the vertical file (as opposed to the library!) in pristine condition. Evelyne, the Wunderkid, is now a fully accredited library technician, having completed five gruelling years of evening study at Prahran TAFE. As Matthew and I have both taken on a year 12 VCE English class this year, Evelyne’s work load has greatly expanded. I thank her for her enormous contribution, effectiveness of the library during this somewhat frenetic year. D’Metri came to Brighton late last year to work two days a week in the A – V department. Always an integral part of a school library, A – V has assumed an even greater importance since – you’ve guessed it – the arrival of the VCE. Since taking up the job D’Metri has performed a miracle of organisation, transforming a moribund and chaotic system into one that is working like clockwork (especially during the two days that D’Metri is in the school). So what does he do for the remaining days of the week? Apart from his “real work”, which is practising to win the Booker prize for Literature, D’Metri now works three days a week at Oxford Press. Previously he worked part time as a library assistant at Wesley College. Faced with the choice of resigning from either Wesley or Brighton Bay, he elected to stay with us – which makes him either acutely prescient, or plain foolhardy. Either way, we are very grateful that he decided to stick with this still buoyant ship. Memo to the Ministry – It’s that sort of loyalty and dedication that is not able to be transferred, relocated or ‘articulated’ elsewhere. As this school year draws to a close the thought of holidays is very appealing. The library staff wishes everyone a Happy Christmas and a relaxing, recharging break. See you all back here in 1992. In the words of the Pete Seeger song, “We shall overcome”. SEA SPRAY BRIGHTON BAY SECONDARY COLLEGE 1991. Page 22. Outdoor Education in Years 9 and 10 is mainly practical. In term 1, all students spent time gaining swimming awards for the Royal Lifesaving Society. Students swam at the Caulfield outdoor pool and the sea baths at Brighton. Recently, students have been doing a number of bush-craft and survival skill exercises. These range from tent pitting, fire lighting, basic bush first aid, and snow safety. Two VCE Year 12 Outdoor Education students, Ben Hayes and Keith Falcao organised a cross age tutoring exercise as part of a unit they are studying. Ben demonstrated the use of snow chains on his car. Keith showed the students the importance of a ‘truckies knot’ to winch a car out of a bog. Water Skills and Safety are an important practical component of V.C.E. Outdoor Education. Students do basic courses in windsurfing, sailing, surfing, snorkelling and canoeing. Such skills, coupled with their R.L.S.S. Bronze Medallion and Pool Guard Award are valuable assets when seeking employment. Students have gone on to Camp America and north to the Whitsunday Islands because of their skills learnt in the Outdoor Education course. SEA SPRAY BRIGHTON BAY SECONDARY COLLEGE 1991. Page 46. Doris retired in February this year, after 21 years with this Ministry. Doris started at Brighton Bay, (Brighton Tech), in 1984 as Head of Department – Business Studies. She became Acting Vice-Principal in 1986 and was appointed Principal in February, 1988. Doris has worked diligently in both her teaching and administrative roles during her teaching career and especially at Brighton Bay. She developed curriculum in the Business Studies field and was always encouraging and supportive of her fellow staff members. Doris was very active in promoting the college both within the Ministry and to the local community. She ensured our courses were well publicised by co-ordinating the advertising literature distribution from the college. Doris always showed initiative in curriculum development and administration. An example of this being her involvement in the development of the new Technology Centre. The Centre was developed by the Technology teachers to ensure they were in a position to offer the new Technology Curriculum as outlined by the Ministry. I would like to thank Doris for her contribution to the college and wish her and Norman well in their retirement together. SEA SPRAY BRIGHTON BAY SECONDARY COLLEGE 1991. Page 51. Psychology is one of the new science subjects to emerge out of the introduction of VCE. Last year Psychology was trialled in year 11 and this year it has run as a fully fledged VCE subject, emotionally and intellectually. Unit 2 investigates how individuals interact with one another and in groups. Preparation is already taking place for 1992. Next year we hope to get the year 11 students out “in the field”. Students will visit pre-schools and kindergartens and observe children at the different stages of development. Also Units 3+4, which investigate perception, emotions and mental processes are being resourced for 1992. The Psychology study design has not been a No. 1 priority with VCAB and was one of the later study designs to get up and running. Fortunately suitable resource material is now being produced and will be available for students next year. SEA SPRAY BRIGHTON BAY SECONDARY COLLEGE 1991. Page 55. THE BAYSIDE TIMES, WEDNESDAY, SEPTEMBER 18, 1991 – PAGE 11. BRIGHTON BAY ENROLLING FOR 1992. BRIGHTON Bay Secondary College is now taking enrolments for 1992 into its VCE (Year 11 and 12) programs and Frame-works (Years 7 to 10) programs. The school’s successful year 11, TOP and T.12 courses have been adapted to meet the requirements of the new VCE. The school offers 34 VCE studies that enables students to develop general programs, or specific programs such as art and design, photography, outdoor education etc. Student enrolments have been growing over the past three years, attracting both local students and others from across the state. This is testament to the popularity and relevance of the programs, the excellent facilities and the enthusiasm and expertise of teachers. The school has built a reputation for excellence in the technical and creative study areas over many years. Students in years 7 to 12 are given the opportunity to take advantage of the facilities and equipment in these study areas, as well as studying some traditional academic areas. A team from the college has recently completed the inclusive schooling integration (ISI) program. This has given teachers a greater insight into the curriculum needs of integration students as well as enabling them to develop strategies to cope with mixed learning ability classrooms. The school has a number of integration students who have settled into the college very well and have developed their skills. The college boasts a comprehensive range of facilities and equipment for photography and outdoor education. Its reputation is second to none in art and design and technology, and has extensive facilities in fashion and textiles and hospitality (food). The library has excellent facilities, including audio-visual equipment and is a valuable resource centre. Up-to-date laboratory and computer facilities provide excellent support for studies across the curriculum and the college hall has basketball, badminton and volleyball facilities and a gymnasium. The school offers special programs in literacy and numeracy with a reading program run by volunteers and a maths task centre equipped with computer and a variety of educational activities. Traffic safety education is offered to students in years 11 and 12. The college provides an environment in which students are encouraged to work and use their initiative in developing ideas and thoughts. Parents feel comfortable when they visit and are appreciative of the success their children experience. In spite of the Acting Principal, Greg Holman, and members of staff being prepared for the opening of the College in 1992, the College did not open. Department of Victoria arrived at the College and demanded the staff in the Administration Department hand over all the keys to the college. The Administration Staff were told to - “Put the keys in the bucket - put the keys in the bucket,” to which they complied. At this time members of staff were still working on the pupils’ school records, which had to be taken out of the school building and sorted elsewhere. Some members of staff were left in shock at the sudden and forceful behaviour of the Education Department representatives. At least one staff member had to seek medical attention on the following day. Even though the Education Department officially closed Brighton Bay Secondary College in December, 1991, the students who were studying Photography and Art under the “Ardoch Windsor” program returned to the school in 1992 and studied there until the end of the year. THE PEOPLE RESPONSIBLE FOR THE CLOSURE OF THE SCHOOL. Brighton Bay Secondary College, previously known as Brighton Technical School for sixty-seven (67) years, officially closed in December, 1991. At that time, the Labor Party was in Office in the State of Victoria. Joan Kirner was the Premier of Victoria. She assumed Office on 10 August 1990 and left Office on 6 October, 1992. Days in Office – 789. Prior to the time when Joan Kirner was Premier of the State of Victoria, John Cain (Labor Party), was Premier between 8 April, 1982 and 10 August, 1990. Days in Office – 3047. Unfortunately for the students in the area now known as the City of Bayside, they lost the two biggest and best public secondary schools in the area - all within a period of three years. Hampton High School, Ludstone Street, Hampton, was closed at the end of 1988 and Brighton Bay Secondary College, (Brighton Technical School), closed in December, 1991. In 1988, John Cain Jnr. was Premier, and Joan Kirner was the Minister for Education. Brighton Bay Secondary College (Brighton Technical School), and Hampton High School were both closed under orders from a Labor Party Government. No. G 49. Wednesday, 18 December, 1991. General. ​A search of the Victorian Government Gazette for the last three months of the year 1991, revealed the formal notice of closure of Brighton Bay Secondary College, (formerly Brighton Technical School). VOL. 3 OF 1991. Page 8. FROM SEPTEMBER TO DECEMBER 1991. (These numbers represent page numbers). The page reference “No. 3517” was the only page relevant to the closing of the Brighton Bay Secondary College, (formerly Brighton Technical School). All the other numbers referred to Government Schools further afield. The next piece of evidence required relates to “SECTION 13 (4) of the EDUCATION ACT, 1958. What is in this particular Act? 16. Vesting of property in Minister. disposition shall be paid into the Consolidated Fund. property acquired for use in the school. ​ council to do so. SANDRINGHAM-BRIGHTON ADVERTISER, Tuesday, January, 21,1992. Page 7. BAY STUDENTS STILL AWAIT PLACEMENTS. STUDENTS unable to enrol in Brighton Bay Secondary College were last week still waiting for notification of placements for 1992. The Ministry of Education, Employment and Training closed the school at the end of last year because of low enrolments. Ex-principal Greg Holman was concerned some students wanting to finish Year 12 had still not been placed at other schools. He said they had been told to wait until the beginning of the school year before finalising their enrolment. Mr. Holman said some staff had also not been told of their placements for the coming year. “The ministry said if the school closed they would make sure students were placed, but some will have to accept a school at the last minute, even if it isn’t really suitable, or be forced to try getting a job,” Mr. Holman said. “I wait with interest to see if the ministry fulfils that promise,” he said. VCE results were not available from the college but Mr. Holman said most of the 220 students had passed. Brighton Council acting town clerk Brian Duffy said the council had not been officially notified of the school’s closure. He said councillors had agreed to support the school’s continuation, but if the closure went ahead any claim on property would be investigated. Mr. Duffy said the council would propose a feasibility study into the option of preparing the site for parkland. SANDRINGHAM-BRIGHTON ADVERTISER, Tuesday, February 4, 1992. Page 3. THE BELL TOLLS FOR END OF “THE BAY”. The final gong sounded for Brighton Bay Secondary College with the resumption last week of the 1992 school year. The Cochrane St. school is now vacant. There will be only minor activity during the year when Ardoch-Windsor College uses the old school building for photography and art and design classes. Last year, the then Minister for Education, Barry Pullen, recommended that the school close at the end of 1991. Students, parents and teachers mounted a strong campaign to save the school, but without success. The general manager for schools in the Southern Metropolitan Region, Dr. Jean Russell, said most students had decided to transfer to Sandringham Secondary College. The president of the former school council at Brighton Bay, Mr. Michael Phillipson, said that a letter from the Education Ministry on December 22 advised him that the school council had been dissolved. “The campaign to save the school is over,” Mr. Phillipson said. A committee occupied the school until just before Christmas when the police “kicked them out”, he said. Eventually the campaign to save the school just “petered out and it is absolutely a shame”, Mr. Phillipson said. “As parents we can’t afford to take Supreme Court action against the Education Ministry; we can only protest,” he said. Mr. Phillipson said the school was also partly to blame for the closure. Dr. Russell said the site would eventually be offered to other education institutions, like Moorabbin TAFE, for use. But if the land is not needed the Education Ministry will sell it, giving other government departments first option to buy. Mr. Phillipson said the ministry may have to return part of the school site to Brighton Council before offering it for sale. “In 1913 Brighton Council gifted part of the school site to the Education Ministry on condition that it remain a school.” he said. Publication : SUNDAY AGE. Page 10. STUDENTS CAUGHT IN POLITICAL TUG OF WAR. ANOTHER state election brings yet another ritualistic tug-of-war over the direction of education in Victoria. School students, as if caught in the midst of a custody battle, must again look on despairingly as the political parties squabble over their future. Victorians spend almost $3 billion a year on schools, but there is no political consensus on whether that money is well spent, or even broad agreement on the ultimate aims of the education system, Increasingly, education has become a contest of ideology. Labor proposes the “social justice” model, arguing that education is about distributing resources and designing the curriculum to give all students an equal start as they enter adulthood. A Fabian Society pamphlet back in 1984 quoted Mrs. Kirner’s vision of education’s role : “If we are egalitarian in our intention, we have to reshape education so that it is part of the socialist struggle for equality, participation and social change.” Labor pledges to defend and extend its changes: the Victorian Certificate of Education; integration of disabled students into mainstream schools; amalgamating smaller secondary schools into multi-campus colleges; and strong central control over the core curriculum, allocation of resources, and staff selection and promotion. The Coalition argues that schools should seek and encourage excellence, and ensure students leave school with a minimum set of basic skills to allow them to work and complete in the outside world. The Coalition says Labor has used the education system as a social engineering laboratory, that it has enforced mediocrity and run a political agenda in setting the curriculum. Labor, in turn, says the Coalition wants to entrench the privileges and advantages of a private-school elite. Labor is opposed to standardised performance measures, such as literacy, numeracy and general knowledge tests, claiming they are distractions, unreliable in design, and unfair to students (and teachers), pursuing less traditional methods of learning. According to the Coalition, much of this is woolly thinking. To get the best out of students, the education system should set more clearly defined objectives. It wants more accountability, so that students and parents can get a clearer idea of how their work is progressing. SANDRINGHAM-BRIGHTON ADVERTISER, Tuesday, November 24, 1992. Page 1. The future of more than 200 1993 VCE students at the Brighton campus of Ardoch Windsor Secondary College is in limbo. (They were located at Brighton Bay Secondary College, formerly Brighton Technical School). The campus, which only caters for Year 12 students, is to close at the end of the school year, along with 54 other Victorian schools. More than 200 students had applied to take the Year 12 VCE course in 1993, according to vice-principal Margaret McDonald. “I am horrified. I think the programs we have here at all the Ardoch Windsor schools – for homeless students, mature age students – are very good,” she said. Ms McDonald said the Education Department planned to keep the courses but at a different venue. “They have a lot to relocate. We have a lot of specialised equipment,” she said. Ms. McDonald said some students had been accepted for next year. “They have been ringing me up asking what is happening and we basically don’t know. We can only tell them what the ministry told us,” she said. “The school council has protested and there will be a public meeting and the school council is trying to discuss the situation with the ministry,” she said. Education Minister, Don Hayward also announced the closure of three other schools in the southern region. Aspendale Technical School was on the minister’s hit list and the 350 students, many of whom take the specialist music course, will have to move. Moorabbin West Primary School and the Moorleigh campus of South Oakleigh Secondary College will also close at the end of the year. Students forced to change schools will receive a $350 grant for books and new uniforms. SANDRINGHAM-BRIGHTON ADVERTISER, Wednesday, December 2, 1992. Page 1. BRIDGE TO THE ARTS BROKEN. STUDENTS from the Brighton campus of Ardoch Windsor Secondary College are angry at the demise of their “unique” school. (They were located at Brighton Bay Secondary College, formerly Brighton Technical School). The Year 12 VCE campus, which is well respected as the only school in Victoria to prepare art and photography students for entry into tertiary courses, is one of 55 state schools to close at the end of the year. The closure will affect more than 200 VCE students who have applied to take the Year 12 course in 1993. Student Janie Parker said the school was the perfect stepping stone from secondary to tertiary education. Other students would be “really missing out” when the school closed, the students said, and the careers of teachers would be at stake. It would be wrong to “split up that team”, they said. Vice-principal Margaret McDonald told The Advertiser (24-11) she was “horrified” by the closure. “I think the programs we have here at the Ardoch Windsor schools – for homeless students and mature-age students – are very good,” she said. 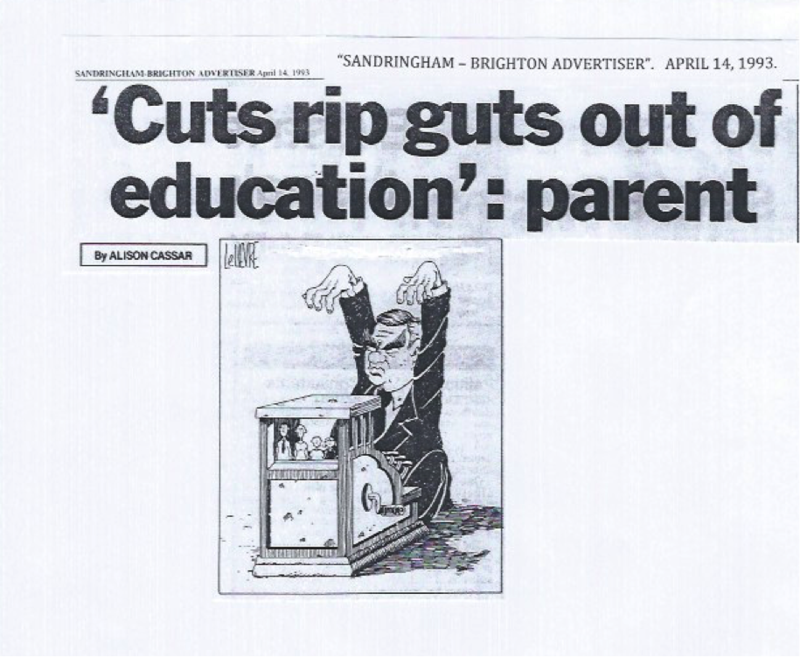 SANDRINGHAM – BRIGHTON ADVERTISER, APRIL 14, 1993. “ANGRY parents will highlight the start of Education Week on May 23 with a protest rally from 11 am in the Treasury Gardens over education cuts. Beaumaris parent Deborah Pagura, publicity officer for Parents Against Cuts to Education (PACE), said education was running on “bare bones”. In April, 1993, Jeffrey Gibb Kennett, (Liberal Party), was Premier of the State of Victoria. He assumed Office on 6 October, 1992 and left Office on 20 October, 1999. In April, 1993 Alan Robert Stockdale, (Liberal Party), was the Treasurer of the State of Victoria. He was the Treasurer in the Kennett State Government from 6 October, 1992 to 7 October, 1999. Alan Robert Stockdale (Liberal Party), was the Victorian Legislative Assembly Member for Brighton from 1985 to 1999. The Liberal Party was in Opposition from 1985 to 1992. Reference : Parliament of Victoria – Ministers’ Database. SANDRINGHAM-BRIGHTON ADVERTISER, August 24, 1994. Page 5. COLLEGE SITE : CALL FOR PUBLIC SAY. THE redevelopment of the former secondary college site in Cochrane St. Brighton should have community input under a planning agreement being considered by Brighton Council. A Section 173 agreement between the council and the developers of the Brighton Bay Secondary College site would give the council input into redevelopment plans, according to Brighton’s acting town planner Ray Butler. A report by Mr. Butler presented at Monday’s Policy and Review Committee meeting said “such involvement is considered crucial to ensure that a ‘nett community benefit’ is derived from any scheme. Mr. Butler said there was a need for the council to be “pro-active” in the development to “add value to the area and retain the flavour of Brighton”. The school site, declared surplus by the Directorate of School Education, has come before council for rezoning from Existing Public Purposes Reservation to Residential C.
Mr. Butler’s report said the rezoning proposal would “facilitate” its sale. SANDRINGHAM-BRIGHTON ADVERTISER, August 31, 1994. Page 11. COUNCIL CALLS FOR CORA LYNN REPORT. BRIGHTON Council has called for a further report on the historic and architectural significance of the 19th. century residence “Cora Lynn”. Located in the middle of the Brighton Technical School site in Cochrane Street, the building has been classified as being “of local significance only”. When the school site was closed and put forward for rezoning Brighton Historical Society asked the council to add the building to the heritage clause of Brighton’s Planning Scheme. Last week a meeting of Brighton Council’s Policy and Review committee recommended against such action due to “the proposed development of the site”, the “relatively poor location” and the “local level” importance of the building. At Monday’s full council meeting, Cr. Vincent Volpe moved an amendment calling for a further report on Cora Lynn. FOLIO NO. 42656 – 43196. POLICY AND REVIEW COMMITTEE - 17TH. OCTOBER, 1994. 30. AMENDMENT L 24 – BRIGHTON BAY SECONDARY COLLEGE SITE. The Manager, Planning Co-Ordination Branch, Development of Planning and Development has corresponded that Amendment L24 has been approved by the Minister for Planning. Amendment L24 rezones the former Brighton Bay Secondary College site from the existing Public Purposes Reservation to a Residential C Zone. The amendment also includes a site specific clause requiring a certificate of environmental audit or statement concerning the suitability of the land for residential uses. Refer to item in the Major Projects Committee for background on the sale and future development of this site. if the College is closed. That the Town Clerk carry out further investigations into the ownership of the land occupied by the Brighton Bay Secondary College. projected numbers of enrolments for 1992. That a report be prepared by Council officers on the estimated cost to purchase all or part of the Brighton Bay Secondary College site and the estimated cost of professional services associated with the proposed purchase. Cr. McKiggan seconded CARRIED. 042878. FACE OF VICTORIA IN OFFICE 20 YEARS AGO. October 4, 2012. 12 : 00 am. FORMER Premier Jeff Kennett has vowed to meet his former cabinet colleagues on an annual basis after getting the band back together to celebrate the anniversary of their rise to power. Surviving members of the Kennett Government came to office and changed the face of Victoria. Liberal MP for Gippsland West, Berwick and Pakenham 1970 – 2002. MINISTER FOR PLANNING : 1992 – 1996. Mr. Maclellan was a school teacher and crown solicitor before beginning his three-decade parliamentary career. He held portfolios under Liberal premiers Rupert Hamer and Lindsay Thompson. He was planning minister for most of the Kennett Government’s life and later took control of the local government portfolio from Roger Hallam. Etc. etc. SANDRINGHAM-BRIGHTON ADVERTISER, January 25, 1995. Page 11. BAYSIDE City Council has issued a planning permit to allow the subdivision of the former Brighton Bay Secondary College site to go ahead. The former school site, at 45 Cochrane St., Brighton, will be divided into nine lots. The land first housed Cora Lynn, a single-storey Victorian villa which was constructed by merchant John McGee in 1878. The Brighton Historical Society made approaches to have the Brighton Technical School added to the Brighton Council’s heritage list. This application was rejected as the buildings were architecturally and historically important only at a local level, there was a proposed development for the site and the buildings were in a relatively poor location. OF THE BRIGHTON TECHNICAL SCHOOL SITE. In 1994, under the Victorian Liberal Government of Jeffrey Gibb Kennett, many Municipal Councils across Victoria were amalgamated. The Cities of Brighton, Sandringham and parts of the Cities of Moorabbin and Mordialloc were amalgamated. The amalgamated area became known as the “City of Bayside”. A Chief Commissioner, Douglas Clark, along with two assistant Commissioners, namely, Heather Norling and Morton Browne were appointed to administer the affairs of the City of Bayside. To quote from page 9 of Douglas Clark’s book “The First 818 Days of the City of Bayside”, published in 1997 - “The reign of the Commissioners commenced on December 15, 1994”. This date is crucial in regard to the granting of a permit for the subdivision of the Brighton Technical School, (Brighton Bay Secondary College), site. In October, 2016, with help from a member of the administrative staff of the City of Bayside, I made a search of the Minutes and Agendas of the Bayside City Council for the period December, 1994 to January, 1995, in an attempt to determine who was responsible for, and when, a planning permit was signed, granting permission for the subdivision of the Brighton Technical School site at 45 Cochrane Street, Brighton. The following Minutes were discovered. “BAYSIDE CITY COUNCIL MEETING. 23 JANUARY, 1995. 7.16 45 COCHRANE STREET – P4560 BRIGHTON OFFICE. with Section 52 of the Planning and Environment Act. 2/ THAT it be noted that one objection was tabled and considered. 3/ THAT application P. 4560 be conditionally approved. Section 66 of the Planning and Environment Act, 1987. ​7.16 45 COCHRANE STREET – P4560 BRIGHTON OFFICE. Proposal : Nine Lot Subdivision of land. Zoning : Brighton Planning Scheme. Planning on 3rd. October, 1994. Address 45 Cochrane Street (ex-Brighton Bay Secondary College). The applicant has submitted what is intended as the first stage of the subdivision of the Brighton Bay Secondary College site. The application proposes the creation of 8 new lots along the Cochrane Street frontage of the site, with the balance of the land (3.69 ha) forming the ninth lot. The majority of lots have a frontage of 18 metres, a depth of 35 metres and a site area of 630 square metres. An area has been set aside between lots 4 and 5 to provide the major access-way to the site. No objections have been received in response to advertising. The proposed lot areas of 618m2 - 630m2 are of a size that could accommodate dual occupancy development. Council could require a Section 173 Agreement specifying that lots are to be set aside for single dwellings, although the applicant has indicated his reluctance to covenant the properties. Such a restriction would seem difficult to justify given that no such restriction exists for properties on the opposite side of Cochrane Street. Pursuant to the Subdivision Act, council can require a land or cash contribution to a maximum of 5% of the site or site value as a public open space contribution. Given the lack of open space in the general area, identified in previous planning studies (“City of Brighton Planning Study” November 1974) it is considered that the provision of open space is most appropriate. A requirement to set aside open space within the second stage can be required as a permit of condition. The Strategy of the Subdivision. It is not considered that the approval of the first stage will jeopardize the subdivision and development of the site as a whole. ​MY CONCLUSION : From the time of the appointment of Douglas Clark, (by the Liberal Party Government of Victoria), to the position of Chief Commissioner of the City of Bayside on the 15 December, 1994, it took him, and his two Assistant Commissioners, only 39 days to issue the Planning Permit for the subdivision of the site of the Brighton Technical School, (Brighton Bay Secondary College). The Planning Permit was issued on 23 January, 1995. The Assistant Commissioners were, Heather Norling and Morton Browne. The Applicant applied for a permit for the creation of 9 lots, 8 of them along the frontage of Cochrane Street, however, the ninth lot was defined as 3.69 ha., the majority of which, within a short space of time, was also subdivided into residential building allotments, making a total of 70 allotments. (See Sandringham – Brighton Advertiser March 20, 1995, page 23). At 9 am on Friday, March 21, 1997, the Commissioners’ tenure officially ended. The members of the first elected Bayside City Council took Office on that day. Reference : “The First 818 Days of the City of Bayside” by Douglas Clark OBE. The SANDRINGHAM – BRIGHTON ADVERTISER dated March 20, 1995, page 23, carried the story of the forthcoming auction of the “St. James Park Estate”, (the site of the Brighton Technical School), at the end of March, 1995. SANDRINGHAM-BRIGHTON ADVERTISER, February 1, 1995. Page 5. COLLEGE SITE LEASED OUT FOR POLICE RETRAINING. The former Brighton Bay Secondary College site has been leased to Victoria Police for the Beacon retraining program unbeknownst to the Bayside Council. Police started training at the Cochrane St. site on January 2, and will finish in Brighton on March 31. The Victoria Police Beacon project, which was adopted to retrain police to handle crisis situations, was initiated after eight people were shot and killed by police last year. Bayside chief commissioner Doug Clark said this week he had no knowledge of the police occupying the site. An estimated 1,500 police from B District, the crime department and transit district will take part in the five-day course at the Brighton site. Inspector Mick Lehmann of Project Beacon said yesterday (Tuesday), that Victoria Police had leased the building from the Department of School Education. Since leasing the Cochrane St. site for police retraining, the DSE has sold the 4.36 hectare property to a developer. A planning permit for a nine lot subdivision of 45 Cochrane St was passed by Bayside City Council at its January 23 meeting. SANDRINGHAM-BRIGHTON ADVERTISER, February 8, 1995. Page 1. POLICE IN DEFENSIVE TRAINING FOR A REAL CRISIS. POLICE training defensive tactics instructor Senior constable Mason Scott (left) feels the pressure of the imitation gun but fortunately for him, it’s not a real hold-up. The ‘robbery’ by a fellow police officer is part of Victoria Police Project Beacon, a new training program to deal with crisis situations. Between January and April, about 1,500 police officers representing all ranks of Victoria Police will take part in the training at the former Brighton Bay Secondary College site. During the training, the officers will learn disarming skills, self-defence techniques (all without the use of a firearm), as well as vital lessons from video tapes of past shootings. Adopted following an increasing number of police shootings in Victoria, the program trains the officer to search all the options in a crisis situation. SANDRINGHAM-BRIGHTON ADVERTISER, MARCH 20, 1995. Page 3. BELL TOLLS FOR SCHOOL HOUSE. HISTORIC “Cora Lynn” on the former Brighton Bay Secondary College site will be demolished – much to the disappointment of a local historian. The 4.5 ha. Site has been sold to Brighton developer Bruce Hamilton who has subdivided the land into 65 lots. The first stage of 34 lots is due to be auctioned next Sunday. Cora Lynn is now being used by police for the Project Beacon training program. Mr. Hamilton said last week that ‘no firm decision has been made” about Cora Lynn, but Bayside City Council interim planning manager David Walmsley said the building would “definitely” be demolished when the police left. But Brighton Historical Society president and architect David Bick said it was important to retain the historical aspect of the site. Mr. Bick said the society had lobbied Brighton Council to list Cora Lynn and another school building in Berwick St on the council’s heritage register. But the council voted against the proposal last year. Mr. Bick said Cora Lynn featured one of Melbourne’s “very few” full-size billiard rooms and had a raised ceiling and a special “lantern” light over the table. And the double-storey, solid-brick school building in Berwick St, Brighton, now owned by Bayside Council, could revolutionise Bayside residential development if it was saved from demolition, Mr. Bick said. Mr. Bick said he submitted plans to Brighton Council last year which showed its possible conversion to five double-storey town houses. An adjacent two-storey building on the school site is already being demolished. Mr. Hamilton said, although he had no control over the Berwick St building at this time, he did not favour retaining and converting existing buildings because they usually had “problems”. “If people are spending money they want something new,” Mr. Hamilton said. Mr. Bick said the sub-division design was “unimaginative”. He said there was scope for a range of housing styles and options, including renovated buildings, as part of the estate. He also pointed out that the basic purpose of VicCode 2’s planning guidelines was to encourage diversity in housing types. SANDRINGHAM-BRIGHTON ADVERTISER, MARCH 20, 1995. Page 23. ALLOTMENTS IN THE HEART OF BRIGHTON. THE forthcoming auction of allotments at the St. James Park Estate (site of the old Brighton Bay Secondary College) is sure to create interest from both locals and buyers from further afield, says developer Bruce Hamilton. “We have already sold several allotments off the plan and expect many more to be sold quite quickly,” he says. The site of the 11 acres of subdivided land is located on Cochrane Street and individual sites range from approximately 330 sq m to 660 sq m, suitable for all types of residential living. The demolition of the old school is gradually taking place, and Bruce says this should be completed in the near future. The estate will be situated around a tree-lined crescent, aptly named St. James Park Drive, with advanced trees planted to create an established look. Each block will feature a wide frontage allowing residents to create a large garden, but each will have enough room for double garage if necessary. Bruce says there are no restrictions on the size of the houses built on the allotments, other than that they be of brick construction. He invites everyone from families to professionals to come and inspect the estate, and says there has already been considerable interest from builders to build display homes on the sites. St. James Park Estate is conveniently located in the heart of Brighton near shops, North Brighton Station, bus, beach and the area’s finest schools. The on-site display centre is open on Saturdays, Sundays and Thursdays and Bruce invites interested parties to come and see for themselves, this once in a lifetime opportunity. Approximately 34 of the 70 allotments will be auctioned at the site on Sunday March 26 at 2 pm, in a seated marquee. For more details contact either Hodges Real Estate (Brighton) on 596-6066, or Cayzers Real Estate (Albert Park) on 699-5999. SANDRINGHAM-BRIGHTON ADVERTISER, APRIL 3, 1995. Page 17. MORE than 500 people turned out to witness the first stage land auction at the former Brighton Bay Secondary College last weekend. Property developer Bruce Hamilton said more than 85 per cent of the 41 lots had been sold and stage two was about to go on sale. Mr. Hamilton said the majority of people buying the land were owner/occupiers building their dream home. Many of the buyers were Brighton people moving out of their large old homes into something smaller and newer, he said. Mr. Hamilton said other buyers had bypassed similar sites in inner Melbourne, opting to move to Brighton where the capital gain on their properties was likely to be high. SANDRINGHAM-BRIGHTON ADVERTISER, NOVEMBER 13, 1995. Page 6. COUNCIL TO PAY $400,000 FOR LAND. BAYSIDE Council will pay $400,000 to the developer of the St. James Park Estate to buy land as a park and as a contribution to drainage works. At its meeting last Monday, council approved putting the council seal on the agreement for the purchase of the land for $320,000. The land will supplement the five per cent allocated for public open space by the developer of the former Brighton Bay Secondary College site. This follows a council resolution on June 26 to pay the developer, St. James Park Estate Pty Ltd., for the purchase of the land. Bayside chief Executive Officer, Peter Akers, said that the retention of land adjoining the estate and listed for sale by Bayside Council could not be retained to supplement the open space of the sub-division. “The retention of the Berwick St. land for use as open space to supplement that provided within the subdivision was considered, however resulted in two small parcels of land which were disjointed,” Mr. Akers said. The land in question has been lodged with the titles office and the title is in the process of being issued. The amount in question has been budgeted for in the current budget. The second expenditure approved by Council for the St. James Park Estate was council’s contribution to the drainage outfall works to cost council $82,000. Council has approved a part payment of $59,920 and authorized staff to process further claims to a total of $82,000. Publication : The Age. Section : Property. Page 3. SECONDARY COLLEGE MAKES WAY FOR A PLUSH NEW ESTATE. Date : 11 January, 1997. IT WAS a sad time for many Brighton families in November, 1992, (sic) when the Department of School Education announced the closure of the old technical school in Cochrane Street. Brighton Bay Secondary College, formally Brighton Technical School, has since been demolished to make way for a plush new housing estate, St. James Park. The only thing remaining, other than generations of memories, is a grand old palm tree that has been moved to a more prominent place at the centre of the site. News of the closure was met with sorrow as locals reflected on the loss of a very old neighbour. While the demand for school placements has been declining over many years, the demand for medium-density housing has outstripped supply as Brighton’s families age. The manager of development at Bayside City Council, Mr. Michael Top, said : “The St. James Park proposal was well received by the council because there has been growing demand for this type of housing for some time, and I believe it is one of the only – possibly the only large subdivision in Brighton for 50 years. The developer, Mr. Bruce Hamilton, of St. James Park Estate Pty Ltd, has lived in Brighton all his life and was keen to play a major role in what he called “a very worthwhile project”. He liked the estate so much he bought one of the terrace town houses and moved in as soon as it was finished. Some of the blocks in the 71-lot subdivision sold independently, but most were developed by Mr. Hamilton’s company, using top Melbourne builders. Five lots were transferred back to Bayside city Council, which originally donated the land to the Education Department in 1930 when the school was established on the understanding that the land would be given back if the site was used for anything other than education. Mr. Hamilton said the new development was based on St. James Park in London, where grand old terrace homes flank a central park. Similarly, the Brighton version has rows of two-storey terrace homes surrounding a central park. (The park has yet to be completed – Bayside Council is considering a final design plan). “We are trying to follow the English garden estate theme. Every street will be lined with mature plane trees and all the homes are well set back behind big nature strips,” he said. The last two blocks of land have just been released for sale, although there are several town houses which will be released as soon as they are finished. The homes vary in size, upwards of 18 squares, and with a few exceptions tend to reflect period themes, particularly the ever-popular neo-Georgian style. The pick of the bunch seems to be the terraces, which flank the park and range in size from 28 to 36 squares. The builder, Bro Barber, of R and J Barber Construction, has paid particular attention to detail and has used top-quality material in his reproduction of old Georgian style homes. The imposing clinker-brick façade is punctuated by double-hung sash windows, a portico entrance and a genuine slate roof. Beyond each formal forecourt is an entrance floor of tessellated tiles. No expense has been spared inside either, where the visitors’ eyes are immediately drawn to an elegant stairwell of Brazilian mahogany. Other lavish features include granite-tops, kitchen benches; gold-plated bathroom fittings; marble-etched open fireplaces; and a 30-square-metre main bedroom with a family-size en suite bathroom and huge walk-in wardrobe; security alarm; ducted heating; air conditioning; ducted vacuum; workshop and a double garage.